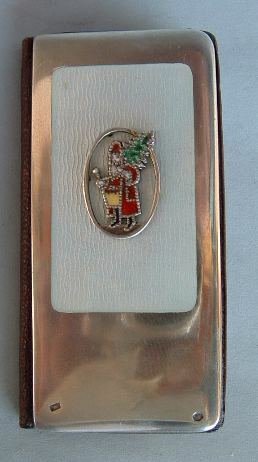 This is a small "carnet" with silver cover and a cloisonne enamel Santa Claus on the middle of a white transparent champleve enamel square. 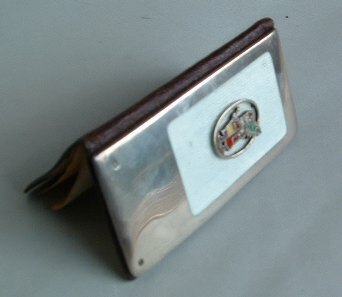 The booklet bears marks of Vienna (Austria) of the period 1872/1922 together with a mark (a lobster) belonging to Franz Krebs Sr. active in Vienna in 1897 (his address was VII, Lercherfelderstr. 73). Krebs was known as a specialist on engraving and enameling. Cloisonne enamel is one of the most painstaking enameling techniques. The outline of a pattern is engraved on a thin metal plate onto which thin metal strips placed edgewise are soldered. This results in forming the desired pattern from cells of varied shape and size. Each of these cells is filled with transparent enamel of diverse colors. The firing is made after which the enamel is polished. Champleve is one of the oldest enameling techniques. Some subject matter or floral depiction is incised in a thick plate. The resulting troughs are filled with transparent or non-transparent multicoloured enamel. Then the enamel is fired. 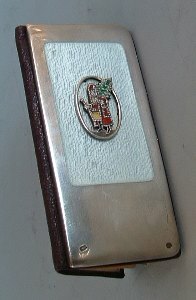 If non-trasparent enamel is used, it is polished and ground after firing. The booklet is 2 3/4 in. long (cm. 7) and was bought from an Italian dealer at an Antique Fair.